This dish is particularly special to me because it has been in my family for decades now. It comes from the June 1989 issue of Bon Appétit magazine. My family has subscribed to Bon Appétit for as long as I can remember, and they save every issue they get, making notes of their favorite recipes on the inside. My parents have been cooking this recipe for my whole life and last week I decided to try and make it myself for the first time. I cooked it for two family members and myself. I decided to share this recipe with you today because not only is it super easy to make, but it’s so delicious. How can you go wrong with green onions and cream? 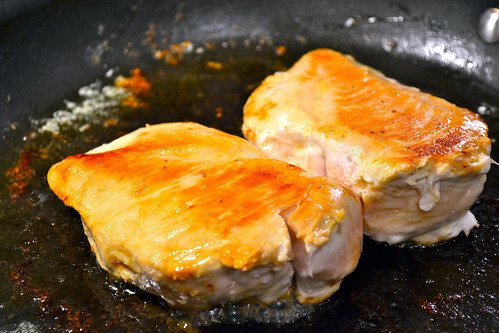 The original recipe says to sauté the chicken breasts whole and slice them afterwards, which I followed. My parents later told me that it’s faster and easier to cut the chicken first and then sauté it. It took me up to 25 minutes to thoroughly cook the chicken and get it to an internal temperature close to 165°F (the recommended temperature of doneness for chicken), because I had chicken breasts that were very thick. I forgot to season my chicken with salt and pepper before sautéing, and remembered half way through. I immediately seasoned, but don’t make the same mistake, season before you cook. The salt needs time to dissolve and mingle with the juices from the chicken. Make sure to plan out your cooking so that everything finishes at the same time. I started cooking the pasta while my chicken was still cooking because I thought my chicken would have been done faster than it was. I had my pasta finished a few minutes before everything else, and although it wasn’t a huge deal, it’s not preferred. If you are making this dish for less people and would like to cut the portions down, be careful. I decided to cut the servings in half and it turned out well, but I did notice that my sauce was a little heavier than I would have liked. I should have added a little bit more broth to the mixture. Either taste test your sauce before turning off the heat, or make sure to measure out properly. A taste test will probably be your best option though. This recipe calls for ¾ cup pasta, which if you’re cooking for 4 people may be enough, or maybe not. It all depends on personal preference. For three Italians who love pasta, we nearly finished the entire bowl. If you like leftovers, go for the whole box of pasta (usually 1 pound). But this means you may have to add a little bit more of some ingredients here and there. The original recipe in the magazine used green pasta (most likely some sort of spinach pasta) as an eye-catcher as well as to make the dish more colorful. Cream, cheese, chicken and plain pasta are all a similar color. Still tastes good regardless! Always get your mise en place before beginning any of the following steps. Things are going to be cooking and added very quickly and you don't want to waste time measuring things out. Preheat oven to 200°F and stick an oven-safe plate in it. Bring a large stockpot of salted water to a boil, getting ready to cook the pasta. This should take 5-10 minutes, giving you time to cook the chicken and ensure that everything finishes around the same time. Over medium-low heat get a 10-inch skillet hot and then melt 2 tablespoons of butter. Season all sides of your chicken with salt and pepper. Add the chicken to the skillet and sauté until cooked, flipping occasionally. This should take a few minutes on each side. When your chicken is done, remove your plate from the oven and place the chicken on it. Tent the chicken with aluminum foil to keep warm and set aside. Toss the linguine or fettuccine in the boiling salted water. I used linguine, but both pastas will be al dente between 7-10 minutes. I usually take 1-2 minutes off the time the box tells me to make sure I get that perfect al dente texture. Place large oven-safe serving bowl into the oven to warm. Add minced shallots to the skillet you were just cooking the chicken in and stir around for 1 minute. If you find that your chicken soaked up most of the butter from before, you can add a tablespoon or less of butter to the pan at this step. Add chicken stock or broth to the skillet and raise the heat to a boil. Reduce this down to a glaze, takes around 4-5 minutes. I used commercial canned chicken broth. Add cream to the glaze and boil until a thicker consistency, stirring occasionally. The sauce will be ideal thickness after about 5 minutes. I may have added a little extra cream at this step, just for the fun of it. The recipe called for whipping cream, but I went on the light side. 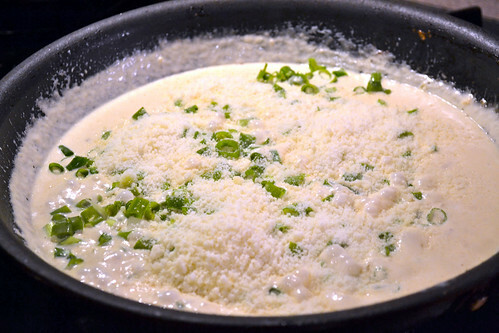 Add your freshly grated Romano cheese and green onions (shallots) to the mixture and stir until the cheese melts and everything blends and thickens. Also, for some added flavor, add the juices that have gathered on your chicken plate. Season all of this with a little pepper. Once your pasta has finished cooking, transfer it to your heated large serving bowl. Add your remaining 2 tablespoons of butter and mix around until the butter fully melts. 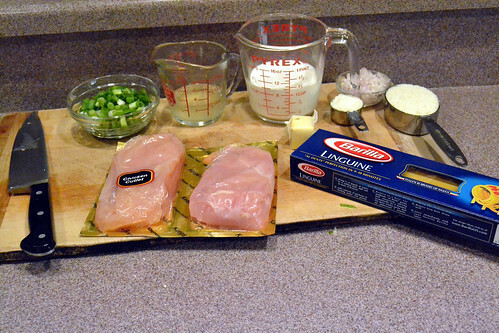 Place your chicken on top of the pasta and finally pour your sauce mixture over both the chicken and pasta. Serve immediately with freshly grated Romano cheese on the side. This recipe looks delicious! Definitely a crowd pleaser, thanks for sharing this Marlee. I really like how you also shared with us what you would have done differently. Great tips. I just found your Blog and I love it! I can’t wait to try Marlee’s recipe since I’m always looking for a good chicken and pasta recipe.I just have one question about it though….What is light cream? I have seen both whipping cream or heavy whipping cream but I can find any thing that says light cream. Help! We too have made this recipe numerous times since it first appeared in the June 1989 issue of Bon Appetit. It is easy to make and is an elegant entree for entertaining or just to put something different on the dinner table. Marlee’s observation of salting and peppering the chicken prior to sauteing is spot-on. My experience is that the chicken is juicier if it is sauteed whole then sliced as in the original recipe as opposed to sauteing sliced pieces of chicken. I have also used 8oz of whipping cream and 8oz of light cream in the sauce instead of 16 oz of whipping cream with the same results. Which measure of green onions should I have added where? You are absolutely right Robert. A little confusing. I think Marlee was trying to say if you didn’t have shallots, you could substitute green onions or scallions. I would suggest using shallots. Because this dish is called Green Onion Chicken with Linguine I would go with a bunch of medium sized scallions (green onions) which amounts to about 6 of them. These get added with the Romano cheese. Not to be more confusing, I might reserve about half of one scallion, mince it finely, and use it to garnish the dish at the end. Thanks for pointing this out. I’ve made changes to my website.